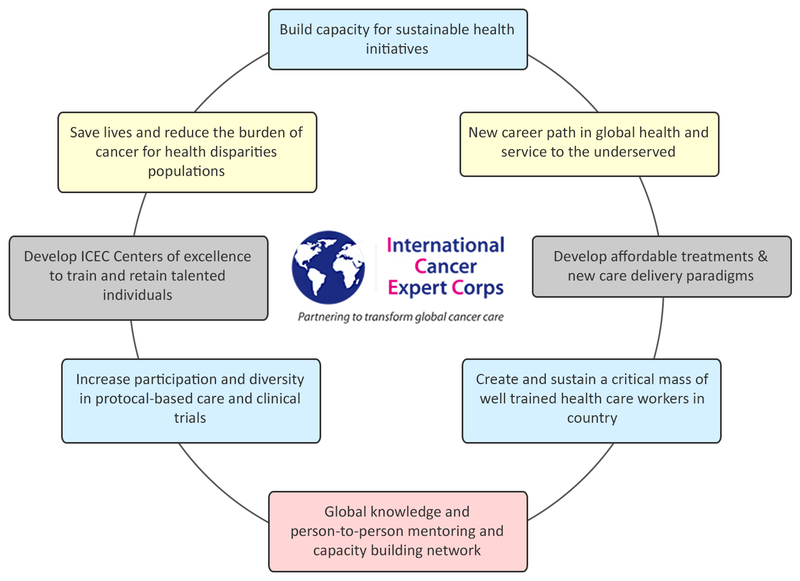 The mission of the International Cancer Expert Corps (ICEC) is to reduce mortality and improve the quality of life for people with cancer in low- and middle-income countries, as well as the indigenous and geographically underserved populations in upper-income countries and regions worldwide. The ICEC addresses this mission through a mentoring network of cancer professionals who work with local and regional in-country groups to develop and sustain expertise for better cancer care. The ICEC envisions a world in which everyone has access to interventions to prevent and treat cancer and its symptoms using high-quality best practices for the local circumstances. Addressing, realizing and sustaining this vision can benefit people everywhere because of the scientific, societal, humanitarian and diplomatic consequences of ICEC activities.